In Quebec as elsewhere in Canada many homeowners make their investments profitable by developing in the basement a rental living space called a Bachelor apartment. Some provide access to the Bachelor through the main entrance of the house, but preferably a separate entrance on one or the other side of the house is built with a staircase leading to the Bachelor in the basement. This allows for more privacy. The Basement Renovation MontrealGroup led by Mr. Daniel Dargis, Engineer and general contractor, takes care of renovating your basement into a Bachelor from the proposed sketches, plans, interior design and the turnkey renovation into a Bachelor. Note that there are other possible uses, besides a Bachelor, as rental income in the basement, such as a professional office or a private home-based daycare. The Basement Renovation Montreal Group under the direction of Mr. Daniel Dargis, Engineer, can help you achieve these renovation projects. The first step to take is to contact the municipality to ask if the zoning laws allow the use of the project you have in mind: of a Bachelor, a business office or a daycare. 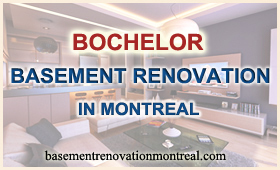 Once the agreement of the city has been obtained, Basement Renovation Montreal may come into play with your Bachelor project. One of our specialists will meet with you to listen to you and discuss with you the ideas of the Bachelor renovation project you have in mind and gather useful information such as: sketches, photos, budget, plan of the current home, take a survey of measurements, see images on the Internet, municipal regulations on the margins of land for the construction of outdoor stairs to the Bachelor and other useful information. Following this, the permit for the basement renovation is received from the plan and then the basement renovation is done turnkey. We proceed with the renovation of the bachelor in the basement including, as you wish, an access with an interior or exterior stair, rooms, a kitchen, bathroom, laundry room and some storage spaces. Before you begin the renovation works of the basement into a Bachelor it is sometimes necessary to move all the boxes and objects that occupy the basement to make room for the contractor. A shed outside is sometimes an option and can be built to store all objects or, also, you can convert the attic. Once the service offer is accepted the basement becomes in a few days’ time the Bachelor you dreamed about and a source of income.